Noah's Ark Zoo Farm is an United Kingdom based zoo from a Creation point-of-view. This genuine working farm is an educational hands-on zoo, enjoyable for all ages. The zoo has huge indoor adventure playgrounds and the world's longest hedge maze. Noah’s Ark Zoo Farm has more than 100,000 visitors a year and is located 6 miles out from Bristol, England. 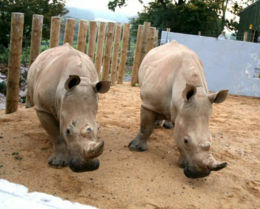 The Noah's Ark Zoo Farm has membership with BIAZA the British and Irish Association of Zoos and Aquariums, South West Tourism, Destination Bristol, Tourism Attractions Alliance. Noah’s Ark Zoo Farm started in 1998 with a trial period, and primarily began with farm and smaller animals. The first to be on zoo exhibit were animals such as rabbits, guinea pigs, goats, and a few foreign-wallabies, rheas and llamas. Noah’s Ark also had a structure built for Food and Farming exhibitions and hands-on activities like the mechanical cow. A large barn was transfigured into what is now ‘Arkiventures’, and an indoor adventure play area filled with slides, climbing equipment, and other fun devices were added in 2000. In 2001 Noah’s Ark could not get camels, bison and deer they wanted into the farm until the end of the year, so instead they added some exotic birds - storks and cranes. The first reptiles also came to Noah's Ark Zoo in 2001. Over the next year, a monkey house was constructed for the accommodation of new arrivals which came to the farm including tamarins, lemurs, and marmosets. More reptiles, and a rescued meerkat also joined other animals there at the farm. ‘Ark Arena’ was converted from a barn which now seats 500 people, and holds educational animal shows. The world’s longest hedge maze (‘the Monster Maze’) was planted in 2003, in conjunction with a huge indoor 3D maze - ‘the Beehive Maze’. Two beautiful shire horses were also donated to the farm the same year. In 2005 South African white rhinos were the new arrivals, which were to live in their partially completed house and fields. Now completed, along with stage 2 of the reptile house and the foundation of the giraffe house. Emus and Lancelot the male llama were also added. In 2006, 'Animal Village' was designed and built and the new 'Show Pens' for large animals, and hawks and owls. The giraffe house, built with many unique features, is the main addition, and is the most modern in the country. Zoo with creationist agenda approved for schools The award-winning and kid-friendly Noah's Ark Zoo Farm criticized by anticreation discrimination. New Scientist, August 5 2010. This page was last modified on 22 January 2014, at 20:10.